The Great Ocean Road's 12 Apostles standing to attention at sunset. Taking a trip along the Great Ocean Road is an Australian rite of passage. Opened in 1932, the road – built by returned soldiers and dedicated to those who lost their lives in World War I – winds 243 kilometres along some of the most awe-inspiring coastline in the world. Taking in rainforests, sunburnt cliffs, shipwrecks and jaw-dropping coastal panoramas, it’s one of the world’s most scenic drives, so wind down the windows and enjoy the view. The road trip officially starts in Torquay, the hallowed home of Aussie surf culture, and curves past classic surf beaches such as Bells to Allansford, just outside of Warrnambool. From the balcony of the Wye River pub just outside of Lorne you can enjoy a drink and see why surfers from all corners of the globe clamour to make the journey here. Witness the waves crash around the Twelve Apostles – towering limestone stacks that have survived 20 million years of nature’s brutal forces. Scuba dive the Loch Ard wreck in Port Campbell National Park, mountain bike through the Otway Ranges or bushwalk among the tall trees and waterfalls of the Great Otway National Park, home to koalas, birds and the elusive platypus. If you’re not up to braving the waves at Bells, you can learn how to wrangle a board at a surf school in Apollo Bay, take a romantic horse ride along pristine shores, or trek the Surf Coast Walk from Torquay to Aireys Inlet. Gourmands can wine their way along the road, exploring the region’s many hidden cellar doors. There are endless ways to immerse yourself in the many natural treasures along this magnificent route. A helicopter flight is a great way to a new perspective on secluded spots such as Cape Otway. Don’t feel like dealing with traffic? How about ditching it altogether and hovering above the Twelve Apostles in a helicopter? Soar above the iconic sights while enjoying a bird’s-eye vista of the magnificent Shipwreck Coast and all its astounding natural phenomena, such as London Bridge and the Arch. Choose from a breezy 15-minute trip taking in the Twelve Apostles to London Bridge; a 25-minute ride over the Bay of Islands or an hour-long journey zipping along the coast to Australia’s oldest lighthouse at Cape Otway. See 12 Apostle Helicopters, phone: 03 5598 8283. Share some time with the family and Australia’s most unique mammal – the platypus. With its duck beak and fur-covered body, this quirky creature baffled early explorers. It’s an elusive little critter, and spotting one in its natural habitat can be tricky, but your guide – a trained ecologist – will know exactly where they are hiding. The tour is a fun experience for the kids and guarantees plenty of photos for the family album. After a short stroll along the shoreline, you hop into a canoe and paddle along Lake Elizabeth, spotting birdlife and enjoying the scenery. A dusk tour offers the added bonus of checking out some of the region’s brighter characters – glow worms. See: Platypus Tours; 0419 670 985. Brimming with succulent local produce, like award-winning lamb and beef, fresh raspberries and blueberries, boutique wines, ciders and beers, the Otway Harvest Trail is a palate-pleasing route with plenty of opportunities to try and buy. Explore the trail’s many artisan producers, provedores and cellar doors, meeting the makers in person and stocking up the car with gourmet goodies. Sample a gin made from raspberries, try a taste of ostrich (similar to beef) and buy your body weight in extra-virgin olive oil, chutneys and handmade chocolates. Pack a map of the region and download the trail brochure. Not quite as ferocious as its namesake, the tiger quoll is Australia’s largest remaining marsupial carnivore, but sadly, this little tacker is fast heading towards the same fate as its cousin the Tasmanian tiger. The forests, woodlands and coastline of the Otway Ranges are one of the last remaining habitats for this special creature. Staying at the Great Ocean Ecolodge (phone; 03 5237 9297), a beautiful property adjoining the Great Otway National Park, you can make a difference to its plight by helping out at the lodge’s wildlife rehabilitation centre. Sign up to a three-day Conservation Insights Program or stay longer for a six-day Conservation Expedition, working alongside dedicated ecologists gathering data and helping to care for the resident tiger quolls. The Grampians National Park (Gariwerd) is internationally renowned for its walks, abundant wildlife, waterfalls, rugged rock formations, spectacular views and stunning spring wildflower displays. It is also a place rich in Dreamtime stories, sacred sites and some good old Aussie bush tucker. Brambuk the National Park and Cultural Centre ( 03 5361 4000) near Halls Gap is not only a mine of knowledge for the area, but brings to life the history and culture of the Aboriginal people of Western Victoria. Sign up for a fascinating rock art walk, get a taste of genuine bush tucker on a bush food walk, or dine on emu, croc, roo and other local specialties at the on-site cafe. Pop in to the centre’s Gariwerd Dreaming Theatre to experience the Dreamtime story of the Grampians. It’s most famous as a drive, but the Great Ocean Road is equally impressive on foot. Inhale lungfuls of fresh, salty air as you traverse the wild coastline on a four-day, three-night guided tour. 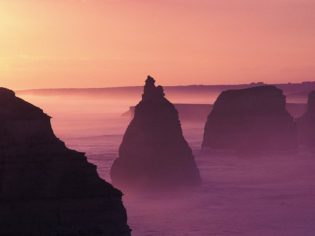 The walk takes in the last half of the trail known as the Great Ocean Walk (phone: 1300 767 416), passing river flats, sandy beaches and ending at the iconic Twelve Apostles. Each day covers around 12-15 kilometres, but at night you can peel off your hiking boots and enjoy the comforts of an award-winning eco lodge. With hot showers and wi-fi (so you can upload your pics to Facebook) there’s even an on-site chef creating low-GI meals to ensure your energy is replenished for the next day’s hike. Spoiled, much? A surfing safari at legendary Bells Beach Victoria. If you’ve ever wanted to live out your Kelly Slater fantasies, you’ve come to the right place. There’s certainly no shortage of ripper surf beaches in this region, and the most famous of them all is the internationally renowned Bells Beach, home to the annual Rip Curl Pro surfing competition. To help you navigate other secret surf haunts, Great Ocean Road Surf Tours (1800 787 353) operate from Torquay and Ocean Grove and offer surfing lessons, with a range of packages to cater for beginners through to the seasoned shredder. Eating there: From the staple road trip diet of bakery food in Anglesea to fine dining and trendy cafes in Lorne and Apollo Bay, you’ll find something to satisfy your tastebuds. There is a great range of wineries within striking distance, too, and gourmet experiences. Staying there: Lorne and Apollo Bay offer the most extensive accommodation choices, from luxury hotels and retreats to cute lodges and B&Bs. There are also camping grounds, caravan parks and backpacker hostels along the way for those on a tighter budget. Head to visitvictoria.com for options to suit all tastes. Yes Great Ocean Road is a world’s best. And don’t forget the small villages like Wye River where the rainforest meets the sea. Many professional operators have beautiful small luxury accommodation like ours – Spa, steam shower, wood fire and fabulous beach views. Quiet stays amidst wildlife. Okay Chris, if you insist! Certainly a lovely piece of road anyway you do it – even on a unicycle!